CHICAGO – Ready to feel old? It’s the 25th anniversary of “Oliver & Company,” 40th anniversary of “Robin Hood,” and 50th anniversary of “The Sword in the Stone.” Maybe I’m showing my age even further by admitting that I would rank the films in order of oldest to newest. “Sword” remains remarkably fun but “Robin Hood” is close behind. Only “Oliver” remains pretty much a waste of time. CHICAGO – Erase from your mind every preconception you may have about a film entitled, “Robin Hood,” and you may find yourself enjoying, or at the very east admiring, Ridley Scott’s loose yet literalistic depiction of the legendary outlaw. No film will ever top Michael Curtiz and William Keighley’s 1938 classic starring Errol Flynn, which remains one of the all time great screen entertainments. CANNES, FRANCE – Wednesday night at the 63rd Cannes International Film Festival was reserved for an arrowing experience with the premiere of “Robin Hood.” Russell Crowe, who plays the legendary archer in director Ridley Scott’s new film, was on the red carpet. CHICAGO – “T’wang!” is the the sound of an archer’s arrow going right into the center of the summer movie kick-off season. 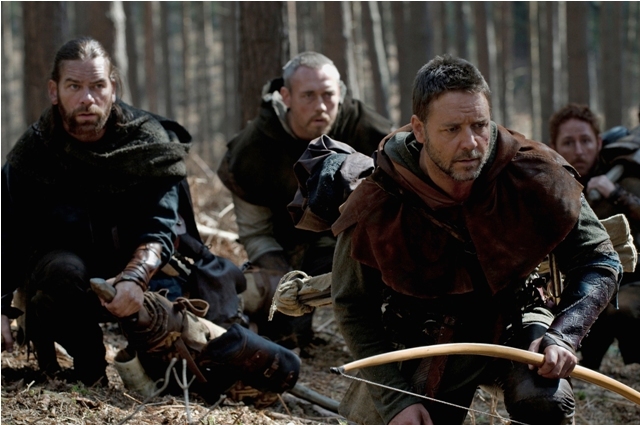 (L to R) Allan ADayle (Alan Doyle), Little John (Kevin Durand), Robin Longstride (Russell Crowe) and Will Scarlet (Scott Grimes) hunt their quarry in Robin Hood. CHICAGO – This 51-image slideshow contains the official press images for Ridley Scott’s “Robin Hood” with Russell Crowe, Cate Blanchett, William Hurt, Mark Strong, Mark Addy, Oscar Isaac, Danny Huston, Eileen Atkins and Max von Sydow. It was written by Brian Helgeland. The film opens on May 14th, 2010. CHICAGO – It’s an old-fashioned phrase for an old-fashioned show but the one I keep thinking of regarding BBC’s incredibly enjoyable “Robin Hood,” the third season of which is now on DVD, is “rollicking entertainment”. Whatever that means to you, “Robin Hood” is it. This show is an entertaining blast, made even more so by a dark streak in the excellent third season. Gru (voiced by Steve Carell) tries to break into Vectors fortress in Despicable Me. CHICAGO – BBC America’s excellent “Robin Hood” returns tonight, September 12th, with the start of what looks to be a much darker, more intense season of the hit show. Continuing to update the legend for a new generation, the writers of this edition of “Robin Hood” find clever ways to keep the spirit of classic incarnations of the timeless hero intact while making it feel fresh and new at the same time.